Say what you want about the iPad and its disappointments: Apple's hot new tablet is sold out, indicating strong consumer demand. And even though analysts expect the iPad to eclipse iPhone sales and thus become one of Apple's most popular products, some tech writers still want the iPad to fall on its face. Here are some of the loudest, most recent complaints. When the iPad was announced, many were pleasantly surprised by its relatively low price (remember when iPods were $400?). Yet some still believe the iPad's asking price is too high and will dissuade widespread purchase. The NPD released a study indicating that affluent Apple fanatics, forever loyal to the brand, are the ones most excited about the device, whereas others are "meh" after seeing the price breakdown. Given the fact that the iPad is sold out and tens of thousands of people opted for pre-order -- even if it was "idiotic" -- this gripe is a little ridiculous. Clearly price isn't a concern for early adopters. However, you shouldn't forget when Apple slashed iPhone prices, which resulted in vicious customer backlash from the thousands who had already picked it up. This could happen again, as Apple already indicated it is willing to make cuts should the tablet fail to live up to the hype. Speaking of hype, the iPad has certainly gotten, and is getting, its time in the spotlight, and skepticism as to whether it can transcend the excited chatter is alive and well. The New York Times put the iPad under a critical microscope, collecting analyst's incredulous opinions. "All the iPad and iPhone optimism leaves many analysts and investors wondering what, exactly, disappointment might look like for Apple. If Apple sells only half a million iPads during the next two months, or less than 2 million by the end of September, it could conceivably damage the company's stellar reputation with Wall Street -- and Mr. Jobs's air of infallibility in selecting and entering new markets." Richard Stengel, managing editor of Time magazine, also gave the iPad a cynical outlook. "Mr. Stengel acknowledges that early iPad content may not meet the hype. He compared it to the era after sound first came into motion pictures. For a while many movies were more like filmed plays, until directors really learned to take advantage of the opportunities of the medium. For the iPad, too, 'the medium is waiting for its Orson Welles,' " reported the Wall Street Journal. Bloggers at the Inquirer are far blunter when it comes to judging consumer demand. Reading between the lines of the aforementioned NPD study, the Inquirer writes, "Overall more than 66 percent thought that they will buy an iPad when hell freezes over." People believe that iPad apps will make or break the device, but what about games? 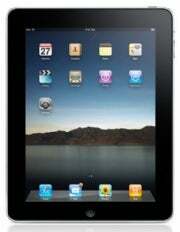 A recent ComScore survey purported that only 30 percent of people said they'd use the iPad for gaming. Yet Advertising Age was quick to point out that when the iPhone was released, gaming wasn't much on consumer minds -- but $500 million in app revenue later, it's clear that the iPhone is, in fact, a gaming device. But since users will be tapping away on a bigger, more beautiful screen, many are worried about how much these games are going to cost. "If you're an early adopter, then prepare to pay early adopter pricing, even if at the prices concerned they're still, for the most part, far cheaper than you'd have ever paid for a games console app, regular computer app or competing smartphone app at any time in recent history," writes iTWire. Apple is known for locking down its products and services -- the battle against iTunes DRM, which came out in favor of the consumer, is a fine example. But hackers are resilient and clever; some even claim they'll be able to jailbreak the iPad upon its release. As much as people love Apple products and are willing to play by Apple's rules, there will always be a subset unwilling to follow the leader, which could mean the iPad may not be ruled by Jobs' iron fist after all. Another big question surrounding the iPad's potential is whether or not businesses plan to adopt. My colleague Tony Bradley believes that due to the sellout, "business professionals have big plans for the consumer-oriented media gadget." Other writers and analysts aren't so certain. TechNews Daily spoke to Leslie Fiering, an analyst at Gartner Research, who stated, "The iPad is targeted at the consumer . . . it's not trying to support office productivity applications." Further, Fiering says the iPad "is going to tend to be focused more toward content delivery, entertainment and gaming."